Inhambane city is steeped in history as one of the oldest settlements on the East Coast, and was once an important port. First founded by Vasco da Gama in 1534 it was the most southerly slave port used by the Arabs. Although large ships seldom dock here nowadays, it still has the largest fleet of working dhows in the country. The cathedrals, the old colonial Portuguese architecture, the African culture and local market places all make it an interesting town to browse around. The main reason for most guests to visit Inhambane are the surrounding coastal areas at Barra and Tofo, located on the peninsular to the east of the town. While they are less scenic and have less pretty beaches than the Bazaruto and Quirimbas Archipelagos further north, they offer great conditions for divers interested in pelagics rather than tropical fish and corrals. From July to November, Humpback Whales can be spotted and Whale Sharks are in the area the whole year round – sightings are almost guaranteed and snorkelling next to these huge creatures is an amazing experience. Tofo is a pleasant if somewhat scruffy village at the back of a broad sandy beach. This place has for many years served as a base for backpackers and self-drivers and therefore, the lodges here are mostly low-priced and rather basic. Barra is located on the northern part of the peninsular and has a more remote beach feeling than Tofo. 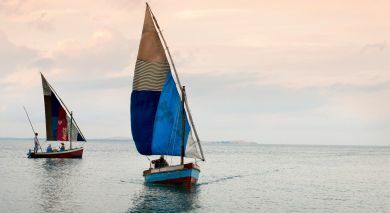 In addition to swimming, snorkelling and diving, it offers the possibility for horse riding, kayaking and sailing cruises. Situated in the Barra Tofo area of Inhambane, Blue Footprints Eco Lodge offers private and tranquil luxury accommodation with spectacular views of the Indian Ocean.